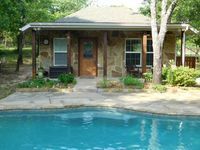 Properties in Springtown average 4.7 out of 5 stars. Property 1: CHARMING! Renovated barn w/private pool and hot tub! Property 5: Lakefront Log Home on 1.5 Gated Acres W/ 130 Sixty Foot Oaks! Property 8: STUNNING! Country Cottage 5 Miles North Of Weatherford, feels like Home! Property 13: Updated Eagle Mtn Lake Home Near Lake w/Boat Ramp! Property 20: Beautiful home on the lake perfect for wedding groups or family get-togethers! Property 21: Awesome, family-friendly lake house with room for lots of guests. Come Unwind At Oak Mill Estate - Gourmet Kitchen GREAT FOR WEEKEND GETAWAYS! Property 29: Come Unwind At Oak Mill Estate - Gourmet Kitchen GREAT FOR WEEKEND GETAWAYS! An amazing stay... not our first but just as great as the first! The host is amazing and the place is perfect!!! very good location. good place. thanks .